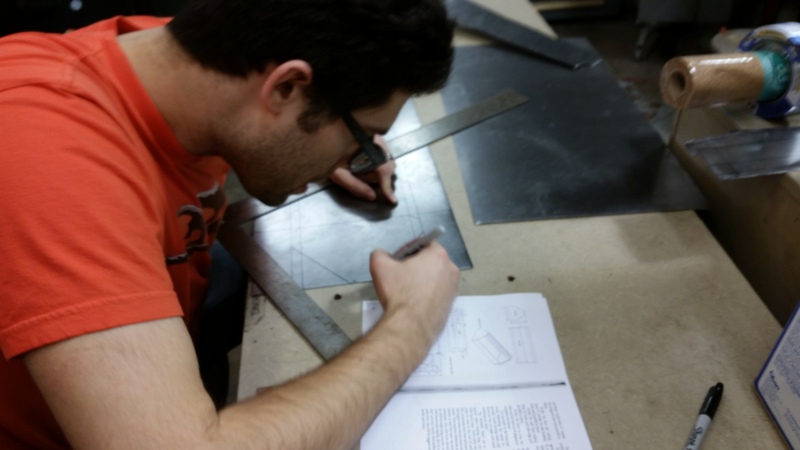 Last Monday, NegativeK got the funny idea that he wanted to do a project to practice his sheetmetal work. 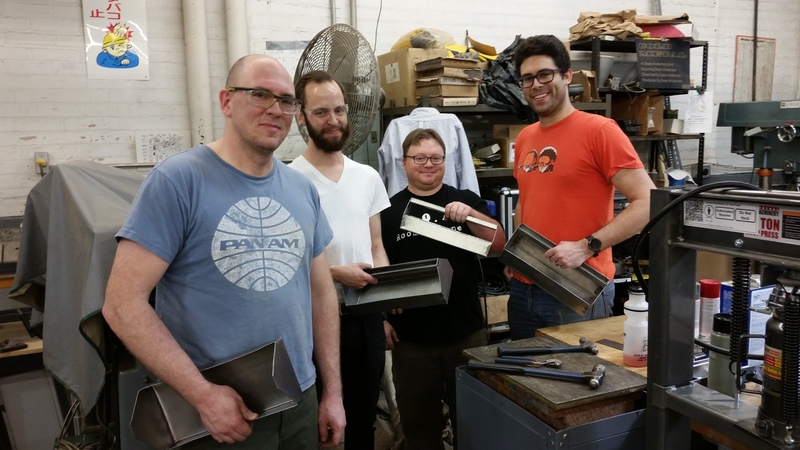 20ga mild steel sheet was ordered, and we collected in cold metals to make some very expensive tool trays. Making a project like this, is a bit of a puzzle. Before we get to the tough stuff, we first do layout. Here’s Toba wishing we had a printer that would do the layout for him. 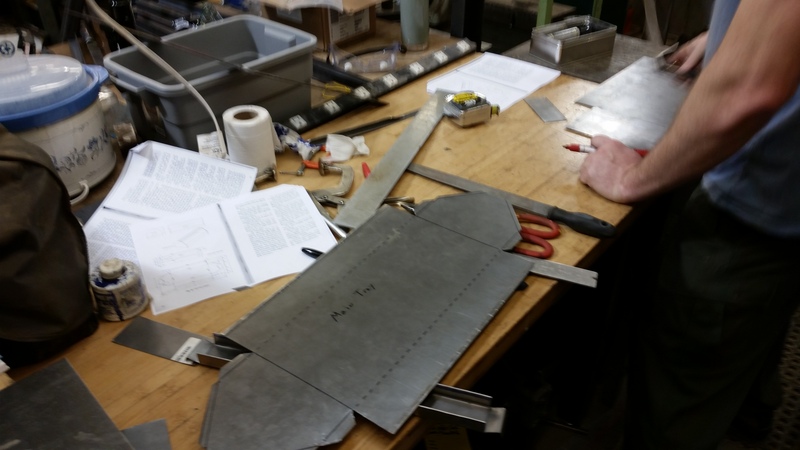 Once we all finished drawing lines all over our sheetmetal we had to come up with how we were going to make all the cuts. 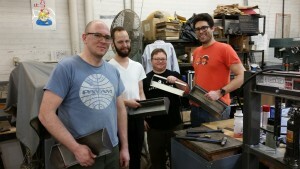 That’s an 8″ shear. It makes cutting sheemetal a magical experience. It’s quiet, smooth, and pretty easy to control. The only thing to remember, is it’s like working with the tip of a pair of scissors. It cuts a long way in front of where you “see” it cutting, and if you reach the end of the cut, it makes a punch mark. Just… it’s steel instead of paper. That does mean making inside cuts is a bit of a challenge. We all had unique approaches to dealing with the inside corners. Now that we have three and a half toolboxes, I think that the “best” method, would have been drilling holes at each inside corner. Instead, I twisted and wiggled out the metal, and used a file to clean up the corner. 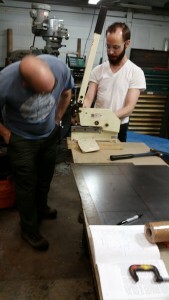 Here’s my tool tray blank. All of the fold lines are marked, and it’s sitting on top of my tool tray handle. I didn’t get good shots of how we did the handles. They were definitely easier than the body of the tool tray. 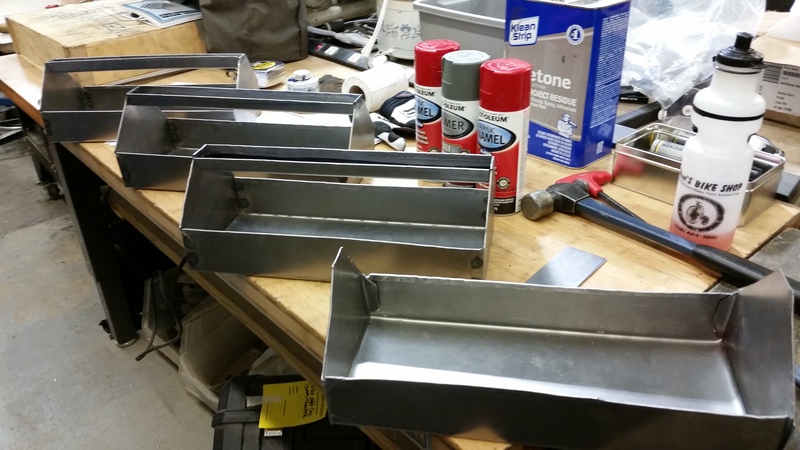 To go from that flat sheet of metal, to a three dimensional tool tray, requires a sheet metal brake. Here’s Toba setting up to do his bends. NegativeK found that our brake won’t do seams well. As if that would stop us. 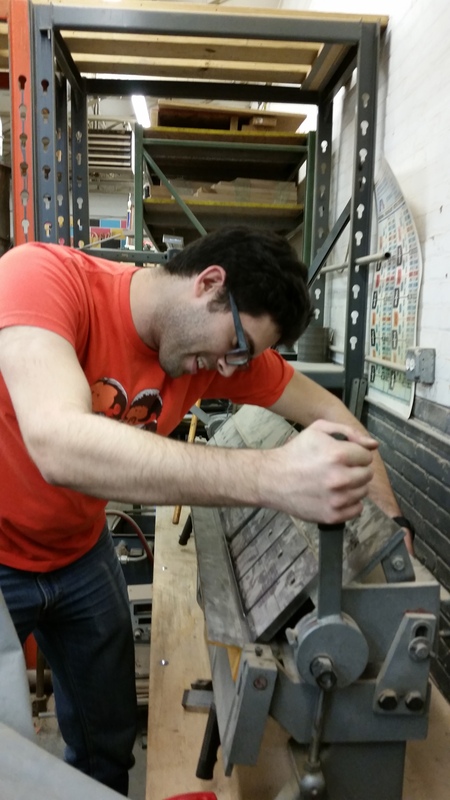 We all ended up using a hammer to finish those folds. Those folds were simple in description, but not so simple in practice. None of ours look machine made. 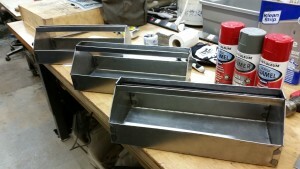 But they do hide the sharp edges, and make the tool trays safe to use. 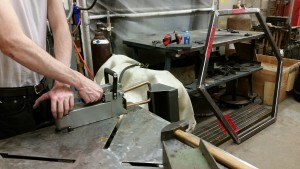 The handles, and sides were affixed to each other with the space’s spot welder. Spot welding is a very quick method for joining metal. I’m glad we’ve got that tool in the space. I had suggested that we might rivet the parts together, but between drilling and attempting to rivet, we’d have spent two or three times longer affixing the parts together. The welds also have the air of “professionally made.” Or at least “not in a garage” made. At the end of the night, Here’s what we had. TachoKnight, Toba, NegativeK, and My boxes. In the future, we won’t put the short guy furthest from the camera. 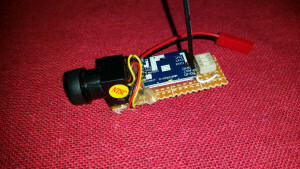 Make anything a Drone: a first person video camera rig. Radio control flying is traditionally done “line of sight.” That is, you stand in one place, and watch your toy fly around. 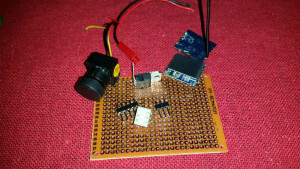 Modern electronics means we can get little cameras, that hobby size aircraft can easily lift. For example, that little camera package you see there, is 17.5 grams. My previous camera package fried when I hooked the wrong power supply up to it a few weeks ago. 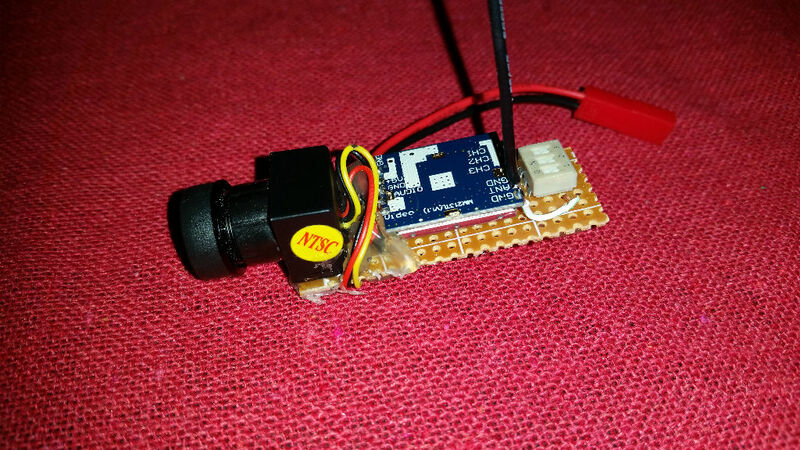 For the record, putting 12.6v from a LiPo battery pack, doesn’t do good things for the health of a 3.3v video transmitter. Here were my ingredients. Not quite mise en place but definitely close enough for hackerspace work. 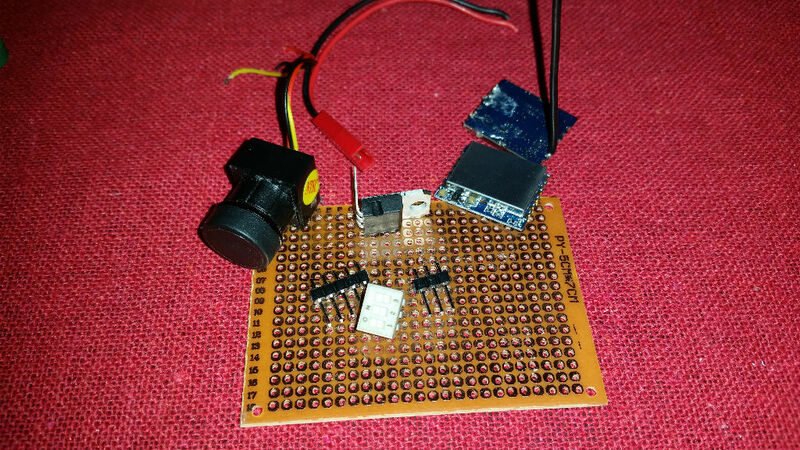 We have some protoboard, my new transmitter, my old transmitter, the video camera, some pin headers, a JST style battery connector, a set of dip switches, and most importantly, a voltage regulator. 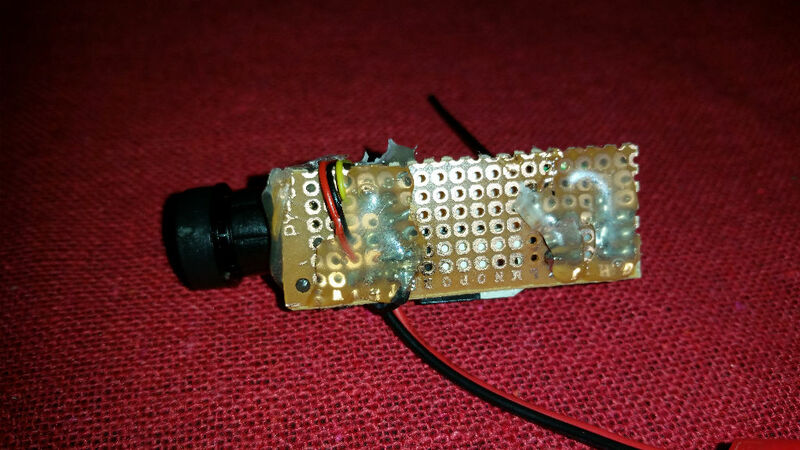 That last bit is to stop me from frying the camera or transmitter on accident again. 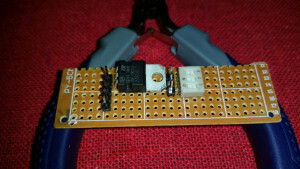 When doing protoboard assemblies, it’s always a good idea to dry fit everything. 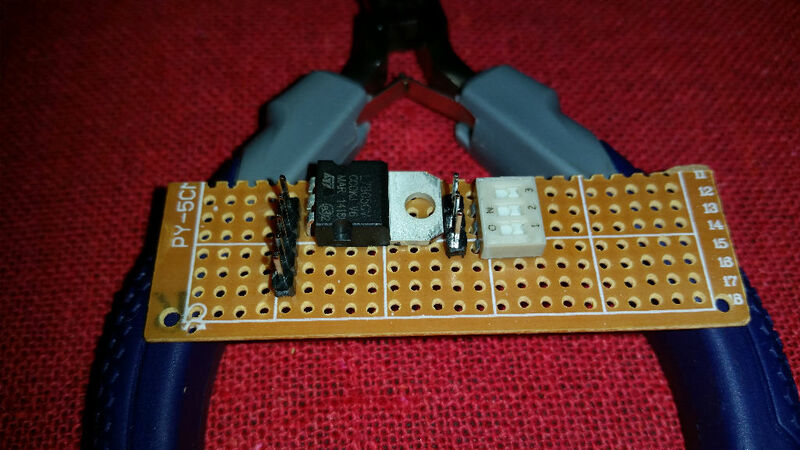 In a fit of bad practice, I have no decoupling (capacitors) to support my voltage regulator. As with many things in electronics.. sometimes it works even if you do it a bit wrong. If the video signal ends up being poor, I can always add more power filtering later. When I first fried the video transmitter, I thought it had shorted out against my quadcopters chassis. It’s not a good idea to leave power rails exposed, so there’s a good bit of hot glue on the bottom of the board. Once that was done, I powered it up, and made sure I could change channels using the DIP switches, and that the video was clear in my goggles. Antennas are a funny thing. 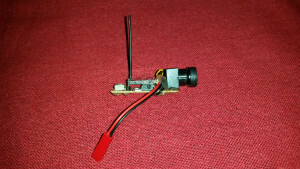 Most people doing FPV use circularly polarized antennas. I didn’t have any small coax handy when I built this the first time, so I just reused my conventional antenna. That little black wire, is a full wave antenna at 5.8ghz! Other than being twice the weight of the previous camera rig I was running, I’m quite happy with how this turned out. Hello everyone! It’s been cold. It’s been snowy. But some of you people are still riding your bicycles. Being cold and snowy doesn’t stop the need for maintenance. Every other week is Bike Night at PS:1, and we’ve got our doors open for you. Sometimes we bring in things to show off. Sometimes we teach. Usually we work on interesting bike projects. (Learning how to wrap bars, building a bike from the frame up, etc) Last night was playing bike doctor more than “here’s fun stuff to work on.” We had two patients last night. Patient #1 received a new chain and sprockets to replace a stretched set. And, the rider discovered the magic of clipless pedals last year, so replaced his platforms with some SPD pedals. Patient #2 had some cheesy short term replacement pedals replaced with some very nice platforms, and had it’s headset rebuilt. 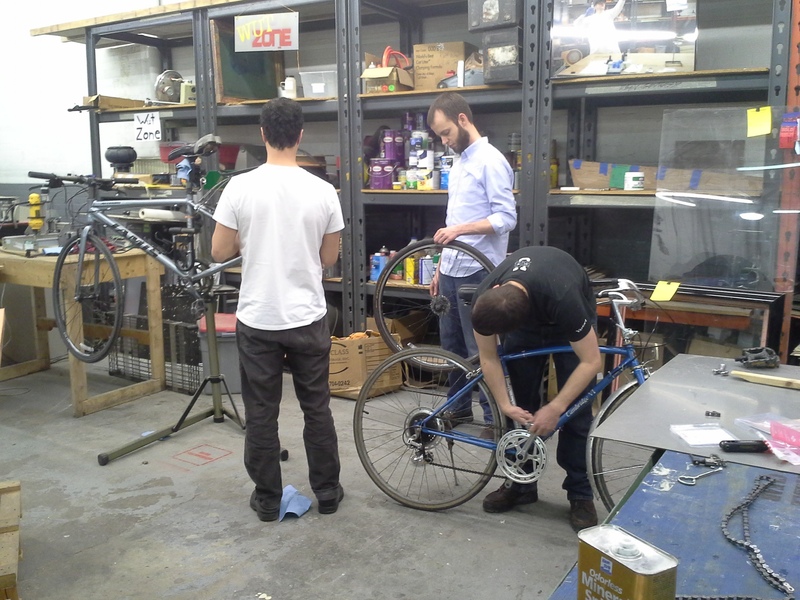 Does your bike need a tuneup? Do you have questions about picking a new bike this spring? Do you want to learn a new bicycle related skill? Come visit us, we’ll be gathering in the shop March 5 at 7PM. A cubists blinky LED. 64 of them to be accurate. 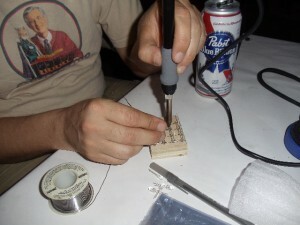 There is something that’s just.. right about someone soldering at PS:1 while drinking cheap American beer and soldering some artsy-fartsy LED toy. James completed two levels of his cube. Localhst did two of his own two. He also built a 12 volt power supply to drive a solder fume extraction fan. Obviously it’s not finished yet. Steve gave me a laser cut project box to put my cube in. Hopefully James and Loclhst will finish their cubes soon too. And as always, come on by, there’s usually something interesting going on! We have a new tool in the space, a small sheet metal brake. It was PS:One designed, built, and tested. It has a 12″ width capacity, and we’re still up in the air as to what it’s vertical capacity is. 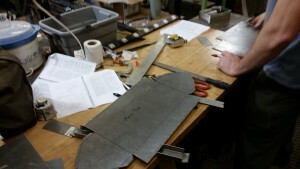 So far we’ve bent some 16ga steel, and 20ga aluminum. It does the job beautifully. 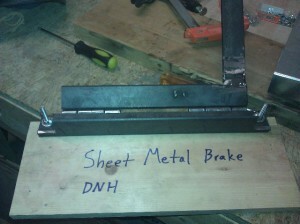 We have a wiki page for it already: Sheet Metal Brake – 12 inch So come on in, and get bending! It’s in the shop. Steve or Nerobro will be happy to show you how to use it.